CRM has been growing in recent years. It is exploding as companies realize it is crucial to invest in CRM to stay current with the technology industry. Since Oracle acquired Siebel in 2006, Siebel CRM releases have been continuous — and so have the innovation packs released every year with new features that have come to include 50 new products and over 700 new features. The Siebel CRM Strategy and Road Map shows Oracle has plans that will continue for over 10 years. Although there has been a rise in Cloud CRM usage, On-premise is still being widely used. The main reason may be security, as not everyone has come to trust cloud-based applications. On-premise also allows companies to have full control over their data. It would also be much simpler to integrate on-premise CRM with other on-premise systems already in use. 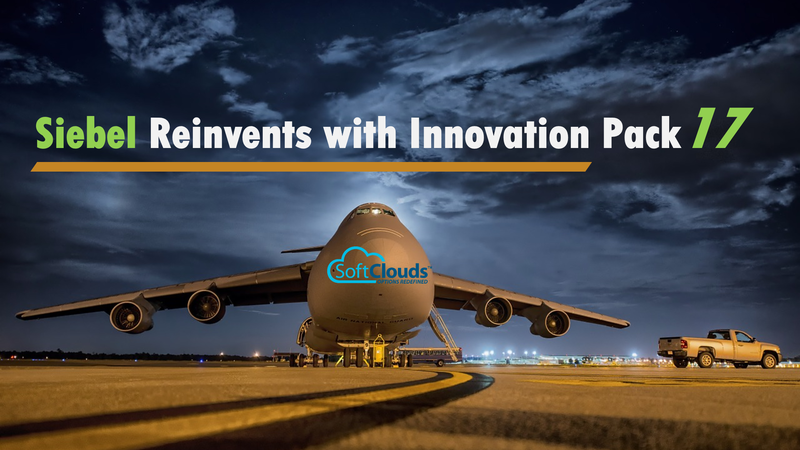 Some companies have been using a hybrid solution that uses a combination of an on premise solution and integrating cloud services. This solution allows companies to choose the technology that best fits their needs. The hybrid solution is perfect for those hesitant to use the Cloud because of security reasons, but still want to use a cloud-based CRM system that allows off-premise teams to access customer information. Not only is a hybrid solution cost effective, it also minimizes risk because CRM is managed internally. Oracle & SoftClouds co-hosted the Siebel CRM Roadshow 2017 on Aug 29, 2017 in Phoenix, AZ. The event was very successful and attended by a number of Siebel Partners and Customers, all eager to hear about Siebel IP17 and the future of Siebel. George Jacob (Group VP — CRM Applications, Oracle) kicked off the discussion with introductions of the Oracle and SoftClouds teams — and then had everyone introduce themselves and their roles at their organizations. George followed up with an electrifying speech on the Siebel CRM Roadmap, Long Term Strategy and Vision for Siebel and then presented a set of innovations in Siebel IP17. The session was very interactive with customers asking questions around strategy and vision of Siebel and also about the features of IP17. Mark Farrier (Director, Product Management, Siebel CRM Applications, Oracle) followed up on George's presentation with a technical deep dive on features of IP16 and then followed it up with an in-depth discussion on the features of IP17. The conversation centered around the cool new features with interest in the Cloud, Provisioning and Scaling aspects of IP17. The best part of the event was a Customer Success Case Study presented by Krishna Jeereddy (IT Manager, Applications Development) of American Airlines. Krishna discussed how American Airlines upgraded premium services with Siebel IP2016 and how AA Premium customer services leverages Open UI to provide exceptional customer experiences. The presentation on Next Gen Customer Experience with Siebel by Balaji Ramachandran (CEO, SoftClouds) was impressive. Bala discussed the Future of CX, Technologies impacting CX & CRM. Bala showcased some of the cool innovations around IoT and Natural Language Processing coming out of the SoftClouds' Center of Excellence. Bala also highlighted a solution where SoftClouds is implementing a hybrid solution with Siebel & Oracle Service Cloud for a large Automotive OEM. Bala spoke about the various Open UI Innovations & Implementations that SoftClouds has done for various enterprise customers. It was a wonderful day where all the attendees got to learn about the cool new features of IP17, the strategy and vision of Siebel, and innovations around Siebel keeps up with the customer experience of the future. Another Beautiful Day well spent with the right folks — Oracle, SoftClouds, Customers & Users in the CRM Ecosystem. The Siebel IP 2017 release is focused on development agility. Oracle describes it as "the biggest, boldest and most innovative release in the last 5 years." The new release aims to revolutionize how customers configure, manage and deploy the Siebel CRM application while providing developers the ability of parallel, collaborative and distributed team development. It focuses on Big Data, IoT, AI, process automation, machine learning, and real-time analytics. Siebel instances can be made ready in less than an hour on Oracle Cloud. IP2017 allows for Silent Install or can be deployed via VM Images, CHEF, Docker, etc. With IP 2017, no Web Server pre-install is needed as Siebel IP2017 comes with a pre-installed Tomcat server. The Application Container is also installed automatically. This simple and quick setup process of IP2017 helps enterprises with reduced costs & less technical implementation issues. The Siebel Composer is browser based and emulates Siebel Tools. This simplifies & speeds up configuring Siebel Business Applications. It features a one-stop application for configuring all aspects of a Siebel Development and Deployment, enables the configuration of Siebel from anywhere via a browser. Workspaces is an alternative of Siebel local database. It consists of a sandbox for editing and allows multiple developers to simultaneously work on the same repository objects in the Siebel database. It is enhanced in the 2017 version for full multi-level branching to support parallel, multi-release development. Workspaces allow developers to have their own sandbox to configure applications and verify changes before delivering to the parent or main workspace. Preview & Publish configuration changes without downtime — no Siebel Repository File (SRF), no Siebel Server restart is needed. IP2017 allows CRUD operations against repository data and publishing them without the need for an SRF. IP2017 focuses on agility and is a browser based setup. With the web-based console, users can configure Siebel from anywhere via a browser. Provisioning Profiles can be managed and features include a Provision Application Interface, Enterprise Cache and Siebel Enterprise & Siebel Servers. Server Management is planned for future releases. Siebel 2017 features a Dynamic Gateway. The redesigned gateway server allows user to add and remove servers without down time. It also features different API styles to access web services, including Representational State Transfer (REST) and Simple Object Access Protocol (SOAP) interface. Furthermore, with command line tools, ADM (Application Deployment Manager) Dev 2 prod Deployment using browser based UI is easy to do. Test Automation Suite is simple to use and provides automated batch/lights-out execution, and test automation. This tool provides Record and Playback capabilities for Automated Test creation. An administration module allows users to manage the Test Scripts centrally and group them into Test Suites for batch execution. The Built-in Automation Framework allows you to record and playback UI flows within the application and no automation scripting is required. With end-to-end Test Management, users can manage Test Cases and Test Cycles and schedule automated batch runs. It also allows for quality measurement and traceability. Siebel Test Execution Framework enables simplified set up of automation clients and features a Jenkins plug-in to manage distributed and parallel automated batch runs and provides consolidated test results in Siebel. Although Cloud CRM has caught on, enterprise customers want to keep Siebel and connect to newer cloud based services. Oracle also continues to release updates through Innovation Packs and monthly patch sets that include new features and innovations. Oracle has a strong roadmap for enhancements over the next few years. The roadmap includes three main strategic thoughts: Customer Experience, Industry Innovation, and Business Agility — that add value to the business. SoftClouds has been innovating on top of Siebel Solutions with NLP based solutions like our solutions like Qupplet, that allows accurate, relevant and fast search results. Other innovative features being looked into are voice command, graphical representation of search results, multi-language input, and auto-completion of questions. Siebel IP17 brings more business agility to the existing CRM implementations and helps enterprises position themselves for the future. With IP 2017, Siebel CRM is easier and faster to install and it makes it simpler for businesses to upgrade and change as needed to address requirements. Hope you found the information on IP17 useful — and here are a few questions for you. What do you think is the "coolest" feature of Siebel IP17? 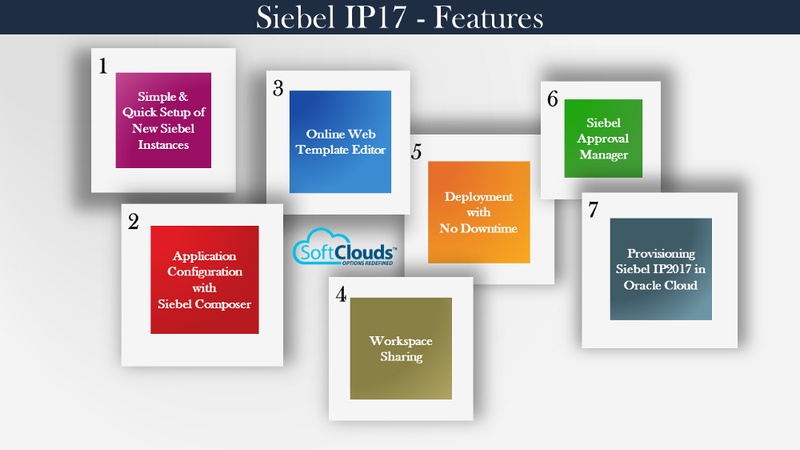 Is your organization ready for an upgrade to Siebel IP17?